The way I've basically set it up is in the lower left hand corner of each grid box is either a blue or reddish/pink square. Blue indicates that they have Arcane Brilliance. Red indicates Arcane Intellect. So as long as all those boxes are full, I'm doing my job as the only mage. Each party is in its own row, so the top row is Group/Party 1 and so on with the pets on the bottom line. 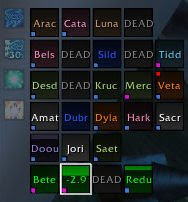 So far, I'm using it just for buffs and to get a quick look to see if we have a bunch of dead people in the raid so I need to make a few quick tweaks - I'd like the box to be a bright red if someone is dead so a quick glance makes the dead stand out more. Also, Grid does a lot, and if I can scale it back a little, it might use less memory and be a bit more efficient. Other than that, the only minor problem I ran into was I had forgotten to whip up my quick /stopcasting /cast counterspell macro, but I quickly made that and was ready for the next Gronn Priest to try and heal. The only major problem I ran into was with Cryolosis. It has some issues with sheeping. Every time a sheep was broken, even though I had turned off notification of sheep breakings, I received a lua error. So I spent a lot of time in SSC clicking lua errors away. At the end of the raid, I downloaded a new addon as suggested in chat, but was unable to test it before people started getting lazy and wiping us on the Lurker Below (more on that later). Here's a screenshot from last night as we were clearing to Gruul. Compared to my previous "action" shots, this one is just so much cleaner and has all the information I need. I do need to tweak the Pitbull spacing a bit later tonight or this weekend, but in all, everything worked quite well. And people seemed to enjoy the random messages Cryolosis outputs when I teleport, portal, or conjure a mage table. By any chance would u be willing to share ur addon compilation? It looks amazing.